After a career of serving as a captain for other boat owners, "Wild" Bill Wichrowski finally has followed through on his long-standing dream and purchased his own boat, the Summer Bay. 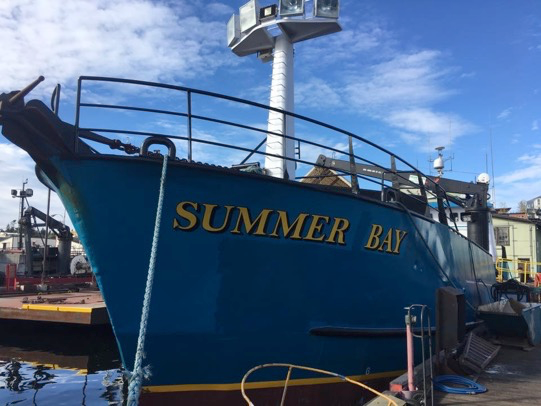 Built in 1981, the Summer Bay is a 32m x 8m fishing vessel with a gross tonnage of 196. Once Bill made the purchase -- which he could not pass up because it was such a great deal -- he had the boat sent to the shipyard for repairs and a new paint job. Shortly thereafter, Zack took the boat out for salmon tendering, a test run for the challenging crab season ahead. Bill is gearing up to helm the wheel of his own crab boat for the first time in his storied career.